A Nagging Question: How is it that Japan's opposition parties, particularly the Democratic Party of Japan, are now so moribund? Did not the DPJ win a landslide victory in 2009? How can these once high fliers now be so irrelevant? Something Like An Answer: Holding aside the New Komeito, which is an entirely different genus of political beast from anything else out there, there are only two parties in Japan with deep bases -- the Liberal Democratic Party and the Communist Party. Commitments to these parties are reliable, in the first case thanks to personal ties, self interest and a recognition of the durability of power elites, in the second in a faith in an ideology and notions of the family. For the other parties, loyalty is largely a matter of the head, not the heart. 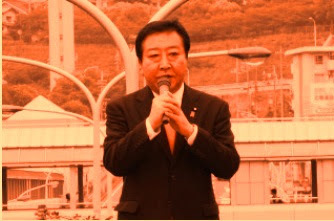 In the specific case of the DPJ, its support, save among members of the Rengo league of labor unions, was at its height a kilometer wide and a centimeter deep. When the going got tough, public support evaporated. Or was it the idea of being in love? During the DPJ's rise in popularity to where its leaders cobbled together a surrogate, but supposedly honest and trustworthy, big tent center-right party, public support arose from out of the latter: the idea of an opposition rather than the actual opposition party in question. The same seemingly holds true for the backing for the other non-Communist opposition parties -- their supporters are not in love with them, they are in love with the idea of being in love with them. Reviving the DPJ (Link) is thus unlikely on a technical level -- for the most part, its supporters had a crush on it, not a relationship with it.